A new era for Azure Files: Bigger, faster, better! Azure Files is the only public cloud file storage that delivers secure, Server Message Block (SMB) based, fully managed cloud file shares that can also be cached on-premises for performance and compatibility. Today, we are excited to announce that Azure Files just got bigger, faster, and better than ever before. That’s right … starting today we are launching the previews of larger, low latency file shares with more IOPS, higher throughput, and Azure Active Directory integration. But wait, there’s more! We are also excited to announce the forthcoming new Azure File Sync agent with significant improvements in the sync performance, tiering, and reporting. 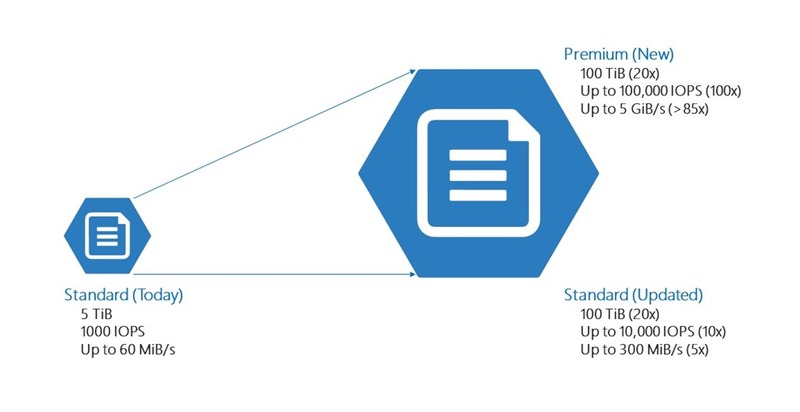 Premium Files, new and now in limited public preview, is optimized to deliver consistent performance for IO-intensive enterprise workloads that require high throughput with single digit millisecond latency. Premium Files is suitable for a wide variety of workloads such as databases, home directories, analytics, content, and collaboration. Its performance, whether measured by IOPS or throughput, scales with the provisioned capacity to fit your workload’s needs. With premium file shares, IOPS can scale up to 100x and capacity can scale up to 20x the current Azure Files scale limits. To accommodate workload IO spikes for a short duration, premium file shares can also operate in burst mode. Learn more about the Premium Files limited public preview announcement and how to try the preview. Standard files, our existing storage, is designed to provide reliable performance for IO workloads that are less sensitive to performance variability. It is well suited for general purpose files services and dev/test environments. We have also made significant investments in standard files to increase the capacity limits by 20x and IOPS limits up to 10x. The preview for the 100 TiB shares with higher scale limits will be launching soon. You can join the waitlist for the preview of 100 TiB shares by completing this request form. Azure Active Directory (AD) integration is a critical capability for Azure Files to offer a seamless lift and shift experience from on-premises file services to fully managed cloud services. Today, we are pleased to announce the preview of Azure AD authentication for Azure Files SMB access. This feature allows the native preservation of Windows access control lists (ACLs) on Azure file shares. It also enables end users to access Azure file shares through an Azure AD Domain Services joined machine with Azure AD credentials. Learn more details on the Azure AD Directory integration preview program. Azure File Sync recently became generally available, concluding a phenomenal preview period with great adoption and feedback received from you, our customers. In this month’s update release we are adding Windows Server 2019 support, a date-based cloud tiering policy, a lot of performance improvements, new metrics charts in the Azure portal for sync, cloud tiering, and server online states - and thanks to Azure Metrics (preview), you can even set up alerts! Furthermore, we have been collaborating with DataON, whose Storage Spaces Direct appliance dubbed Kepler-47 is well-suited for Azure File Sync. Simply create a VM on this cluster and leverage all the benefits of Azure File Sync on top of DataON’s innovative footprint. Come and learn at Ignite; and go try for yourself! Learn more about the Premium Files preview and how to join the preview program. Submit larger and higher scale file shares preview request form to join the preview. We will contact you once preview is available for you to try. Read details about the Azure Active Directory integration preview program and how to get started. You can share your feedback via Azure Storage forum or just send us an email at AzureFiles@microsoft.com.